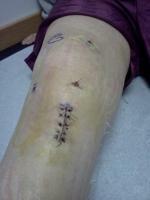 I still cannot straighten my knee completely since ACL surgery May 7, 2008. It's at minus 8 degrees at best. Can you advise? To give you some history, I first tore my meniscus in the left knee while jogging and had surgery for that in April 2007. After about 2 months of rehab I still could not straighten my knee completely. Then I tore my ACL (June 2007) while I was still recovering from the meniscus tear. Went back to the ortho Dr. and he wasn't convinced I tore anything (even though I insisted something was injured in my knee) so I was sent on my way to more rehab. After several more months of rehab, and only able to straighten my knee to minus 5 degrees I went to a different ortho Dr. who diagnosed me with a torn ACL. Did ACL reconstruction the following week (7 May 08) and I've been in rehab again since May 08. I am still unable to straighten my knee completely. I've been told by a new ortho Dr. (my surgeon has since retired) that I may never straighten my knee again. That it could be scar tissue built up. Now I have hip pain, lower back pain and pain in my right leg because it bears a good portion of my weight most of the time because I cannot stand completely straight unless my weight is on my good leg. Any advice or information you can give me is appreciated! I am desperate here. I was very active prior to the surgeries. Running, racquetball, softball, volleyball, you name it, I played it. I am a 45-year-old woman and understand that us older folk don't heal as quickly. But I have a hard time accepting that my knee will never straighten completely again. With the medical technology out there isn't there something that can help me with this problem other than a total knee replacement? I also have osteoarthritis in my knee which I never really had before the meniscus surgery. My workouts now consist of a recumbent bike, eliptical machines, and walking/exercising in the pool. All are great for staying in shape; however, I can't even do those with the intensity that I want to because of the constant pain in my knee and inability to straighten it completely.